Many thanks. Given the recent report that Earth may be more sensitive than previously estimated, I was very interested in your overview on sensitivity. And just as interested in your observations on the progress of models. My bias is that we can expect too much of models, and that the (important! worthy!) effort to improve them will one day face a point of diminishing returns, so I’m looking forward to next year’s look at skill and winnowing. Mexico City inches closer every day. By how much does the solar forcing, which is currently remaining unusually long at a low value, affect this picture? Do you intuitively think the dynamic ocean components will ever be predictable over more than a cycle or so or should they be considered ocean “weather” which will always cause a variance between measured and predicted climate? Because you’ve used annual averages rather than monthly, the impact of autocorrelation on the trend analysis is small. Just a rough guess: the corrected error ranges will be about 20% larger than the stated values. Is the occasional Pinatubo-type eruption also included in the models? Do we have an idea from vulcanolagists how often these (and stronger) eruptions might be expected to occur? Thanks. Have you considered inviting George Will up for a personal tour of GISS ? As someone who has taught simulation studies at university level I find the discussion somewhat amusing. It is possible to remove the CO2 component of all models and replace it with any submartingale and arrive at the same upward sloping graph. There are many such statistics in the real world – the number of Mars bars consumed, for example. The link between CO2, or Mars bars, and climate change is not proven by the models. Norbert (3) — See papers by Tung and co-authors for the newest estimates of global temperature variation over the course of an average solar cycle. I don’t know how well accepted this work is yet. Douglas (7) — Big volcanoes erupt randomly so other than putting in some in model runs following the power law distribution on VIX magnitude there is not much to do. But as Gavin states, occasion eruptions won’t matter much and big ones are certainly only occasional. If atmospheric CO2 is linked to surface temperatures in a dose relationship, why aren’t we seeing that? Especially when observing graph 3 “How well did Hanson do?” On the otherhand if atmospheric C02 is only a quasi reflection for the generation of particulates, and atmospheric particulates are more determanent of surface temperatures as we have seen when volcanos erupt, then the variable distribution of particulates would be better to track than atmospheric CO2. Instead of trying to improve existing climate models tracking CO2 and temperature, maybe models should be developed to track atmospheric particulates and surface temperatures. I come at this from the point: when the model fails, discard the model. Is it possible to add error bars to the surface temperature records? Graham (9) — Do explain how Mars bars cause stratospheric cooling, please. You know, you may actually have a point. Regarding post #9, citing one’s own credentials as a university lecturer, physicist, software engineer, airline pilot, janitor, or any of myriad of other “qualifications” is rather silly when that pose is struck in support of a jocular sophomoric prank or confidently expressed but naive statement borne of ignorance. Influence in this discussion stems purely from serious intellectual content, not window-dressing. There are numerous excellent examples of posters here on RC able to support serious discussion, including a vanishingly tiny handful of genuine skeptics, persons worth emulating whatever one’s inclination may be. In the case of #9, we see conversation on Gavin’s interesting topic essentially being vandalized by irrelevantly self-described lecturer “Graham”. To what end? We can only guess, but the intention of making a contribution to improvement of the human condition can be ruled out. One thing we can conclude is that it took a very short time indeed for somebody to begin emptying garbage on this thread. Surely you can do better, “Graham”. Fred @14 has a point. The “cooling” we have seen since 1998, or was it 2001, has been the result of increased pirate activity around the horn of Africa. Once the pirate activity goes down we can expect the global warming to return. 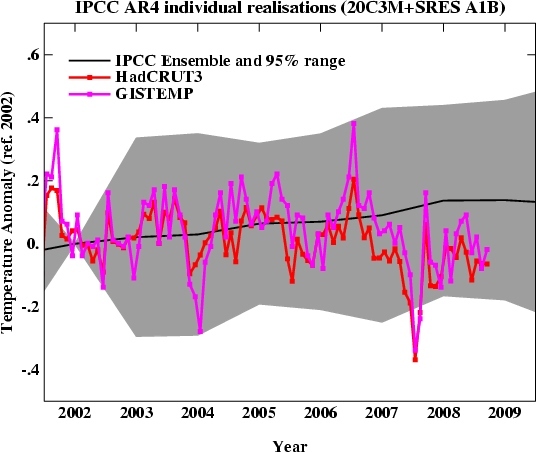 The IPCC AR4 came out in 2007. Now the prediction would have been made a short time before that. Why does the comparison graph start way before 2007? This to mean comes across as betting on a horse race after it has started, already knowing who has fallen and who hasn’t. ie. The test has to be a test on future temperatures, not on whether or not the model fits the past. Otherwise you’re cherry picking. Same applies. When was the prediction made, and how well has it performed after the prediction? I don’t know of many forecasts made in 1953. Also here, no confidence intervals, so given the inclusion of known data to say how good a prediction something is, its not good statistics. Similarly, why don’t the scenarios all start at the same point when the prediction is made? ie. From the graphs, the strong conclusion is that the prediction is both a forecast and a hind cast, and so doesn’t demonstrate predictive ability. If we take the first graph, a simple polynomial curve fit would also show a hindcast that matches and a good forecast, but in reality be a useless predictor of the future. Since some of these models have been fitted to the temperature record, and the temperature record has been shown to be suspect, isn’t it a case of garbage in, garbage out? A troll, but a very amusing troll. RiHo08@11, we seem to have something in common: Neither of us has a frigging clue what the hell you are talking about. Particulates? What particulates? Aerosols? Soot? We would all love to hear about your miraculous “particulate warming mechanism”. However, whatever you come up with, the greenhouse nature of CO2 is KNOWN physics–that’s why it is in the models, and why your imaginary mechanism is not. The solar max – solar min is calculated to give a surface temperature contribution of 0.11K according to Lean and Rind [*]. The contribution of Tung (0.2 oC max to min; and back again of course!) is considered to be on the high side (Lean and Rind suggest that Tung’s value is a bit too high due to neglecting to account for volcanic cooling which was in phase with 2 of the last 5 solar cycles). So all else being equal, the solar cycle contribution should completely negate a CO2-induced temperature rise of 0.2 oC per decade, during the descending period of the solar cycle (2003-2009 for the current cycle). Since the current solar minimum has been somewhat contracted, the solar cycle contribution to current temperature variation might be a little bit more negative…. Fred, while the year isn’t over yet, both the temperature number and the number of pirate attacks increased (the pirate attacks more than doubled) since 2008. Obviously more study is going to be needed. It’s complicated by the use of high-power water cannon to repel pirates, which probably increases low-level cloud nuclei over the oceans. It’s a bit disingenuous to use an entire degree as your error range. How about a map of Arctic temperature anomolies? Graham’s point is somewhat valid (correlation alone doesn’t equal causation) but then he spoils it with the Mars Bar example (where there is no possible causation anyway)… So I think he didn’t understand what is being done here. If I regressed observed temperatures on a Mars Bar time series then I’d get a positive relationship between them (though other diagnostics could tell me that there is a problem). But that’s not what is being done here. Rather forecasts are being compared to the observations. And these show that the climate models could be correct. But they don’t rule out an alternative explanation. But you’d have to be able to show a causal mechanism for that other explanation and then show that the predictions from that other explanation could also produce decent forecasts. So Mars Bars are ruled out. What a coincidence. I’ve taught simulation at the graduate level myself. I can give you a submartingale which does not reproduce the upward slope. You can too, if you think about it for a second. about Kiehl’s paper on models. I’ve looked at the AR4 TOA downward solar flux data and found that GISS ER/EH were the only models with realistic post-20C3M variability. The other modeling groups just used a flat solar constant, not even a solar constant + cycle. I was surprised to find that some used a flat solar constant for the entire 20C3M period. How do you think this unrealistic solar irradiance (pre/post 20C3M) affects the quality of the simulations? I had done some tests looking for changes in variance in the pre/post-20C3M periods but didn’t find anything conclusive. I suspect that without that solar-induced variability, it would allow CO2 to have an unrealistically large influence. While you are correct in saying that the issue of low-level cloud nuclei formation over the oceans possibly caused by use of high-power water cannon to repel the pirates requires further study and better modeling techniques, the fact remains that this in and of itself doesn’t in any way undermine the trend in warming and the clear linkage with the decreasing number of pirates. You see, we haven’t established any direct correlation or causation of any warming due to increase in pirate attacks. The data is still showing a clear reduction in the number of actual pirates, despite the fact that attacks by this reduced number of pirates has increased. I realize this may at first glance seem to be somewhat counter intuitive to the layman who has not delved deeper into modeling of this particular phenomenon. I will however be more than happy to post both my data and the actual source code which underlies the models. The climate model we employ has a global mean surface air equilibrium sensitivity of 4.2 C for doubled CO2. Other recent GCMs yield equilibrium sensitivities of 2.5-5.5 C…..
Forecast temperature trends for time scales of a few decades or less are not very sensitive to the model’s equilibrium climate sensitivity (reference provided). Therefore climate sensitivity would have to be much smaller than 4.2 C, say 1.5 to 2 C, in order for us to modify our conclusions significantly. Well, 20 years down the road you can finally see the difference. Of course you could re run the 1988 model with the more likely sensitivity to CO2 forcing. Global cooling after volcanic eruptions has been recorded in ice core data and thermometers,:1809, 1815, 1883, 1980 etc. and others. If coal burning produces particulates, especially those sources with unregulated emissions, particulates, sulfer dioxide, etc. may impact climate changes. Since the last decade of divergence of atmospheric CO2 and surface temperatures suggests that any linkage between the two is much more complex than current modeling would imply, other ideas regarding climate change and what is influencing it should occur to all of us. I am mearly suggesting another idea that has caused global cooling in the past. In this case, atmospheric CO2 is only a surrogate marker for the particulates/SO2 etc. A plausible and testable hypothesis. I would like to test my understanding by responding to Graham’s comment. After looking it up in Wikipedia, it seems to me that a submartingale has the property that its expected value will grow over time. Ok, so then I think the point of the comment is that one cannot infer a causal relationship between CO2 and warming from the data. But then the comment misses a crucial point, because (if I understand) the purpose of the simulation is NOT to prove a causal relationship. The causal relationship stems from the physics. The main point of the simulation is to estimate parameters and project more detailed effects than the global mean temperature. Of course, if the projection had been grossly inconsistent with the data, one would have to search for overlooked physical considerations. There is something about these climate models that I would like to understand. Perhaps you could point what is wrong with my logic. These are model runs that were published in time for AR4 which was published in 2007. Assuming that they had to be completed a bit before that these runs would have been done around 2006. Looking at the graph that you produced the average tracks the HadCRUT3 average almost perfectly up until that time. Given that the HadCRUT3 average is a kind of standard of correctness in this field isn’t that what we would expect? I know that people talk about the models being independent in some way of the actual values, but this seems unrealistic to me as any significant deviation would probably indicate an error to the modelers, or to the people selecting models for inclusion in a consensus document. Therefore I would tend to judge your graph by looking at the period prior to 2007 as being the “known” period for the models, and the period after 2007 being the forecast period. Based on this principle all one could say is that the actual results have diverged downward from the forecast. Certainly any economic model would have been judged in this way. So the summary of what you have shown is that in the long term the model produced by Hansen in 1988 is significantly too high with current temperatures actually being below his scenario “C”. A comparison of actual temperatures with those forecast/projected by AR4 shows that AR4 in the very short term is also running too high. What did Hansen do right in scenario C? Are we able to figure out where and why his model succeeds? Re: 8 … I applaud the efforts, Gavin. But George Will is with the Washington Post. Never know, a personal invitation might just charm the bowtie off him. By the way, I’m teaching a course in climate change at Utah State University this coming semester — for nonscience majors — using your book as the principle text. Thanx for getting back to the science. Looking at the grafs, i notice that ocean heat content jumps about the time surface temperatures fall below ensemble mean. But thats maybe, probably, just a coincidence…? Thank you, Gavin. The graphs look to me to prove that you have done a very good job of predicting. All of the real global temperatures are close enough to your predictions. You did better than Hansen, as expected, since Hansen’s forecast was made at an earlier date. Computing power was less then, and knowledge was less then, so Hansen did well for his time. Predicting climate change is necessarily a very difficult thing to do. Showing real data on the same graph as computer models is clear proof that this isn’t “just a model” thing. I conclude that we are in very deep trouble. I don’t see how anybody can disagree. The 2002 to 2009 nitpick is just that, a nitpick, no doubt caused by weather. There is no way to avoid the conclusion that something is going terribly wrong. There is no excuse for delay in doing something about it. I know my congressman is committed to the cause because I have talked directly to him about climate change at every opportunity. Senators are harder to get to see directly. Most people don’t want to hear about it. I don’t know what else I can do. I’d like to get back to the pirate issue. What steps have the world’s leaders taken to increase the number of pirates to prevent global warming and save the planet? Was this even discussed at Copenhagen? How can we combat the disinformation of the pirate deniers? Is the Hansen 1988 graph the one with the large CFC forcing? If so how much of the difference is accounted for by this? I think that Graham is essentially right in reminding that a comparison between a model and data is meaningful only if the probability that the data would look like they look if the model were wrong is very low. This is obviously not the case with the “new” data, which are probably compatible with ANY reasonable model anyway. In other words, it would be IN ANY CASE very unlikely that the average temperature would have decreased enough to “exclude” the current GCM,whether they are right or wrong. So the piece of information brought by the addition of a single point is actually very low. Note too, that the Hansen et al projection had very clear skill compared to a null hypothesis of no further warming. Nice work. Could you do it for precipitation ? Apologies if the following question has been answered before. It seems that the models have somewhat overestimated the surface temperature this decade. My question is: where is the energy that would have been contained in the surface layer had the models been more accurate? Do the models show it somewhere else within their domain, e.g. in the upper atmosphere? If so, are such places now warmer than the models predict? Or, is the excess thermal energy, predicted to be in the surface layer, in outer space or the ocean depths (which I presume to be outside the domains of the models) instead? Thanks to anyone for taking the trouble to answer this. Instead of comparing past projection with what was speculative progression of GHS concentration, why not rerun those model with the actual value. Getting the right answer from the wrong value doesn’t validate anything. In my discussions (more like arguments) with “skeptics”, would I be right in saying that even at the “coldest” point during the “current cooling phase” that global mean temperature was higher than at any point prior to 1998? Is that the correct interpretation of the 2008 data point? I would hate to see the denier types be cleaned out completely, but maybe a “wall of shame” type thread could be made where the denier posts could be sent, that can not be replied to, but the long list of repetitions of the same tired old talking points could be visible to everyone and show WHY they are not welcome in the actual discussion threads? It could also act as a sort of trendline, where we could see the talking points appear, run their course, then reappear the way they do over time, showing the seemingly contrived nature of them. Just an idea.